The Chevrolet Trax has gone on sale in the UK, and it finds itself going head to head with the recently-launched Peugeot 2008 and Renault Captur in what is easily the UK's fastest growing market sector. These small crossovers, headed by the popular Nissan Juke, are hot property with buyers who appreciate chunky looks, practical interiors and a lofty driving position. Chevrolet's new proposition should fit right in. We road tested the Trax range at its international launch in April, and concluded that although it was capable and interesting, its entry price of £15,495 was too high - and the Trax's combination of talents weren't enough at this level. Four months on, and the with the full UK line-up, pricing and pecifications confirmed, we now have a much clearer picture of the Trax's chances of success. First impressions are positive, with its muscular looks bang on target for likely buyers. The raised ride height, and black cladding along the flanks on the bumpers add character, ruggedness in potential parking hot spots. Inside it's just as thoughtfully considered for the rough and tumble of modern life. The interior plastics are all hard-wearing and - mainly - look good. But some sharp edges and brittle textures mean it lacks the polish of some of its rivals. And yet, it all seems in keeping with what you'd expect from a Chevrolet - a US-inspired car designed with a long working life in mind. Like its rivals, there's plenty of tech to keep smartphone users occupied. As well as good integration via the MyLink system with the touchscreen infotainment system, you can use voice commands, via an iPhone's Siri system. Live map and traffic updates are also seamlessly integrated - assuming you have a good mobile 3G contract and data allowance. In terms of room, there more than enough up front, with excellent head- and leg-room. The rear compartment is a little tighter, but still more than adequate for typical growing families, while the boot ranges in capacity from 356 litres with the seat-backs up to 1370 litres with them folded. Driving position is commanding with a good forward view - the rear blindspots are adequately dealt with by the large door mirrors, while the bulky A-posts will prove a constant source of irritation, especially in town driving. The 1.4-litre petrol turbo should be more interesting than it is. It's certainly powerful, and has a good spread of torque, as evidenced by its tall gearing - and on the move, it's both refined and appears to be reasonably economical. Acceleration is brisk, and on the motoway, it's quiet and lopes along at the legal limit without fuss. But on A-roads, and for overtaking especially, you need to work it harder than you might reasonably expect to, finding that you'll often need to drop two gears rather than one to get the job done. And then it gets a little buzzy. The instruments are interesting to look at, but hardly cohesive, with the digital speedometer display doubling up for various ancillary functions, such as cruise control, compass and gear change indicator, and it all looks a little cramped and low-rent. That's in contrast with the big analogue rev counter that flanks it. But there are some thoughtful convenience features dotted around the passenger compartment, such as a three-pin plug socket in the back, and a pair of gloveboxes upfront, as well as numerous other stowage compartments. We like the concealed charging and docking ports - a nice touch. The steering and handling are surprisingly good - and it's clear that early promises about tuning the Trax for UK consumption have been kept. The steering is light and responsive, and more than acceptable for its class. Ride quality good, although sharper bumps can resonate through the cabin, while the steering is responsive going into corners, and body roll seems to be kept well in check. Overall, the 1.4LT in front-wheel drive form is a likeable, chunky and well-equipped challenger in a crowded market sector. 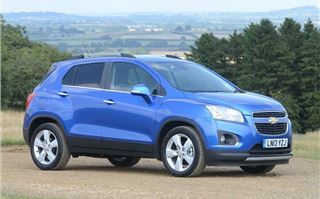 Given the strength of the opposition, the Trax is more than likely to be omitted from a few shopping lists. And that's a shame because the Trax has a fair bit going for it, most of all a sense of good old fashioned honesty. There are some concerns that stop us short of recommending it wholeheartedly, notably most the unimpressive emissions and lack of a super-clean sub-99g/km version, and even with stop-start 139g/km is a little off the pace. There's also its list price, which doesn't quite chime with Chevrolet's 'value for money' proposition. So, don't be shy about asking for a discount, should you be tempted to take the plunge.